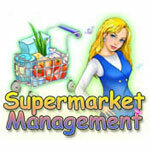 Supermarket Management Game - Download and Play Free Version! Help Kate Manage Her Way To Success! Kate has recently graduated college. On her way to find a job she becomes stuck in a traffic jam. Taking control of the situation she directs traffic at the crowded intersection to the joy of many frustrated drivers. One of those drivers is Bob Bossovich, CEO of Superstore. Impressed by Kate’s take control attitude and fearlessness he offers her a job. Now it is up to you to help Kate climb the corporate ladder of success. 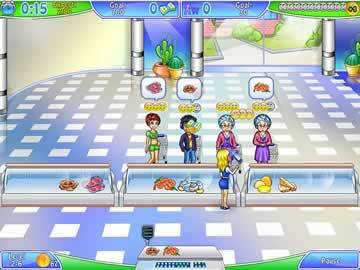 In the fast paced Time Management game Supermarket Management you can help Kate succeed by earning coins to upgrade shelves, buy carts, improve machines, and expand coolers. 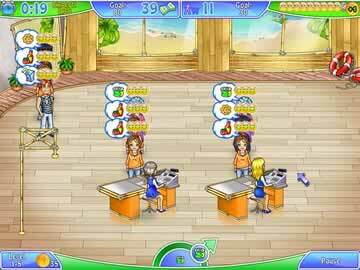 Hire employees to make the store run more efficiently. Add sample booths where the customers can test your vendor’s products. The more customers you make happy the more coins you make. If you are fast on your feet, and keep up with the demand, you will be assigned bigger and better stores. Hurry, your customers and your future are waiting for you!